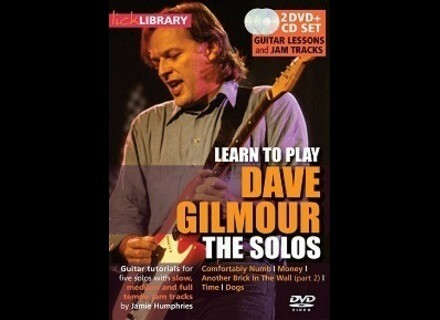 Learn to Play Dave Gilmour the Solos, Guitar tuition/press from Lick Library. 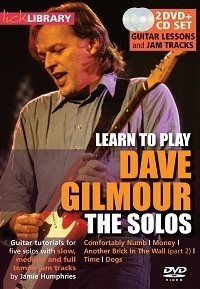 Lick Library’s extensive range of guitar tuition DVDs has just got bigger with the release of Learn to Play Pink Floyd Volume 2, Learn to Play Dave Gilmour the Solos, and Quick Licks in the style of Dave Gilmour. These new DVD sets give you the chance to study Dave Gilmour’s legendary guitar solos, licks and riffs and are presented by Jamie Humphries who draws heavily from his own personal experience of playing with the Australian Pink Floyd. "Jamie Humphries studies note by note five classic tracks in this guitar workshop including Time, Mother, Learning to Fly, On the Turning Away and Have a Cigar. Each track is explained and demonstrates the techniques used such as rhythmic chord variations, blues scales, time signature changes and much more. This double DVD set also includes an in depth analysis of David Gilmour’s gear and its use, to help you get that Pink Floyd sound. An added bonus is actual footage of the Australian Pink Floyd live at the Royal Albert Hall." "Jamie takes you through the mighty solos from five timeless tracks, Comfortably Numb, Money, Another Brick in the Wall (Part 2), Time and Dogs on this double DVD set and CD of with jam tracks. This unique style of guitar lesson allows you to learn each solo at slow, medium, full tempo and play along with the tutor. You can practice these different tempos along with the accompanying CD of guitar jam tracks, further helping you study at your own pace." "This guitar tutorial helps you learn killer blues licks in the style of Dave Gilmour. Jamie studies chord progression, dynamics, vibrato, whammy bar techniques and a whole lot more as you look at licks based around famous Pink Floyd tracks. These can be picked up quickly and incorporated into your guitar playing. Each lick is taken in short sections, played and explained slowly, and built up into full tempo. After this, you can play along to the accompanying guitar jam track to practice your new licks and techniques." Check out www.licklibrary.com for more details. T-Rex FuelTank Chameleon T-Rex announced that they have a new FuelTank power supply ready. It will be in stock mid January 2010. Martin Guitars Performing Artist Series Martin & Co. announced the launch of the “Performing Artist Series,” a line of acoustic/electric guitars set to debut in 2010. Vigier Christophe Godin Excalibur After 10 years of collaboration between Christophe Godin and Vigier, the company presents the Christophe Godin Excalibur.